Epiphany is from Greek language meaning 'manifestation or appearance'. and myrrh (an embalming oil) as a symbol of death. "gold, as to a king; myrrh, as to one who was mortal; and incense, as to a God." 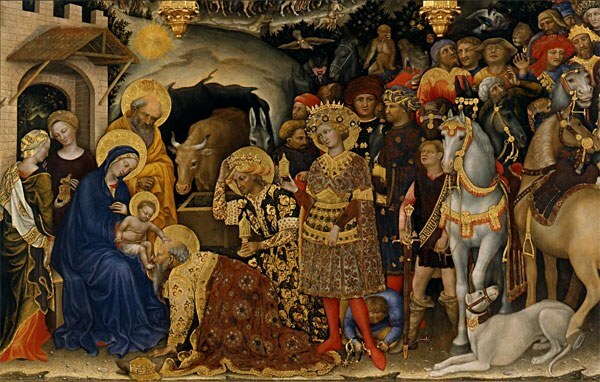 This tempera on panel painting is by Gentile da Fabriano, Adoration of the Magi, 1423, in the Uffizi Gallery. On "El Día de los Reyes" Spain and Latin American countries celebrate the biblical adoration of baby Jesus by the three Kings. In Spain ‘Los Reyes Magos’ - Melchior, Caspar and Balthazar - play a similar role to Santa Claus in many other parts of the world. Spanish children write letters to the Three Kings, who then bring the children gifts the night before, or on the morning of the Epiphany. In some houses children leave their shoes outside the door so that the Three Kings will fill them with gifts. Spanish children make sure to leave a drink for each of the Three Kings and some food and drink for their camels. Huge Three Kings parades or ‘cabalgatas’ are held around Spain on January 5th. They are spectacles featuring hundreds of actors and are broadcast live on Spanish television. Every city and sizeable town stages a parade, and one of the biggest, in Madrid, draws crowds of 100,000 people, including thousands of children eager to catch the sweets thrown into the crowd by the three kings themselves. The oldest Three Kings parade in Spain has taken place in Alcoy, Alicante since 1885. 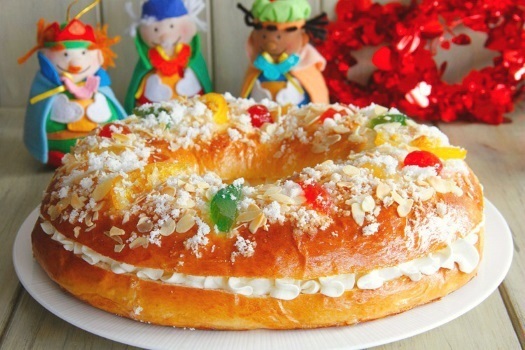 On January 6th, Spaniards typically tuck into a Roscón de Reyes, a Three Kings cake, baked in a ring and decorated with candied fruit and hiding a, sometimes lucrative, surprise. A small figurine of the baby Jesus, a little toy for children, is typically hidden inside the dough, as is a dry fava bean. Whoever finds the toy is crowned king or queen of the celebration, while the one who finds the bean has to buy the Roscón next year. Some Roscón bakers hide real treasure in their festive cakes, including gold ingots from the Corte Ingles (a big departmen store) - which would be a sweet surprise for someone to find in their slice.